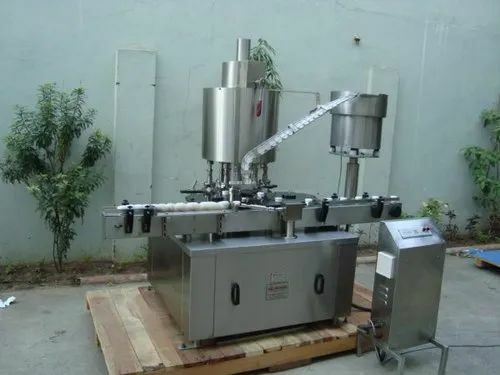 We manufacture Capper machine for bottle, screw capper, cap pressing machine, Plastic bottle capping machine, PP capping machine, Chuck capper for bottle , Jar, Jerry can, Glass bottle, Pet Bottle, HDPE bottle capping machine as know cap sealing machine. 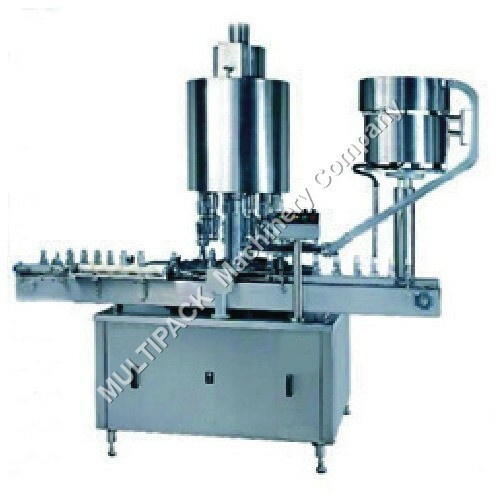 DescriptionInline Capping machine Depending on customer output needs, It specially designed for the tightening of pre-threaded caps and consists of a linear capping unit, stainless Steel slat conveyor and gripping belt assembly, The filled bottle coming with cap chute and pick up cap with the cap comes on an in-feed conveyor where the cap is tightened by three/ four roller wheel pairs of rollers while it is being held by the gripping belt. The speed of the slat conveyor and bottle gripping belt is synchronized and can be varied by AC variable inverter drive. 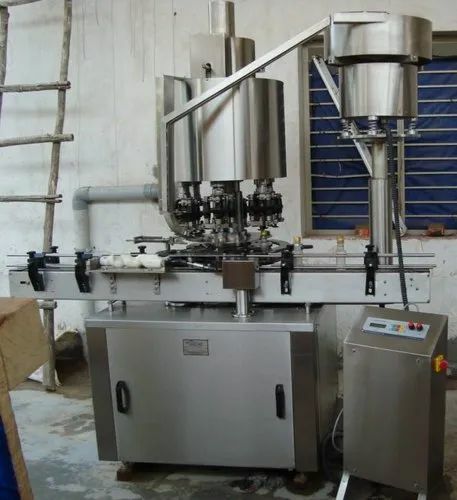 The inline capper machine can be provided with the Cap elevator , rotary / vibratory feeding system for automatic cap dispensing , this systems fixed by our production team as per cap and bottle designed. 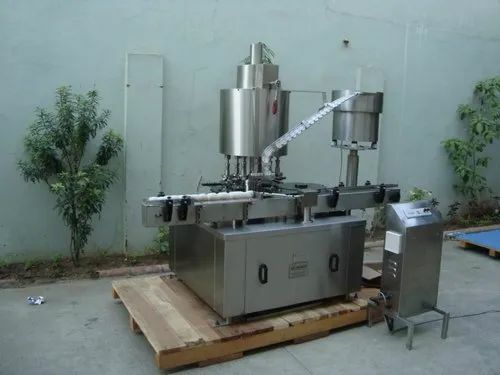 Inline capper / linear screw capping machine best suitable for Detergents, Oils , Liquid soaps , Household/janitorial cleaners , Glue/Adhesives ,Household cleansers , Herbicides , Polishes , Lube oil, edible oil, Pesticide , cosmetic bottle glass jar or bottle, Jerry can, lubricant can, HDPE jar or bottle, PET jar or bottle Inline / Linear belt gripper type capping machine suitable for Pharmaceuticals, Dairy, Breweries, Edible Oil, Food, Distilleries, pesticides, Toiletries, Cosmetics, Lube, Ancillaries etc. Production Speed Per Hour 1800 to 3600 Bottles per Hour (Speed Depends up on the size of caps & bottles). Polycarbonate Enclosure with Stainless Steel Structure. 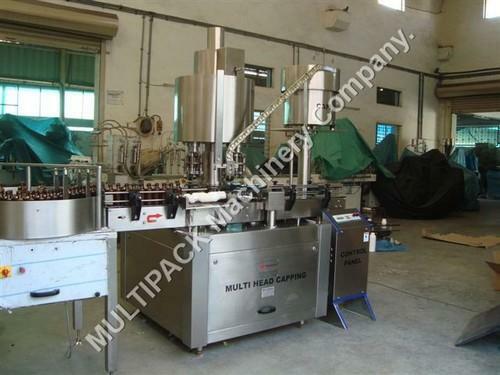 Big jar capping machine will be made bigger so some of above specifications will be changed. Production Speed Per Hour 6000 to 6600 Bottles per Hour (Speed Depends up on the size of caps & bottles). Production Speed Per Hour 1800 to 3000 Bottles per Hour (Speed Depends up on the size of caps & bottles). Number of head 4 Nos. 6 Nos. 8 Nos. Change parts required (A) Container: Star Wheel, Back Guide, Feed Worm(B) Cap Die, Delivery chute, bowl & S.S. Star wheel. 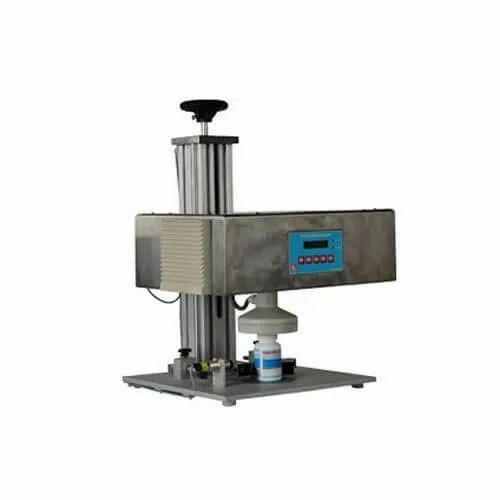 We have gained a remarkable position in the industry by offering a distinguished collection of Rotary Bottle Capping Machine. This comprehensive assortment is manufactured employing progressive technology and superior quality components in sync with set industrial standards. Our offered machine is available in varied sizes, grades and specifications to meet the variegated demands of our clients. Additionally, the entire machine is rigorously examined by our experienced professionals to ensure its flawlessness. 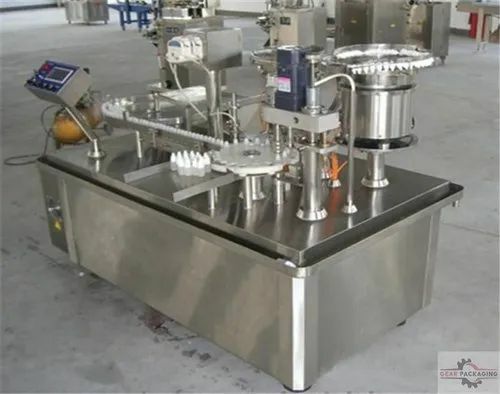 The Automatic Measuring Cup Placing System consists of main structure, product transmission belt with adjustable guide, Bowl for cups, cup deliver chute, pressing head with dancing roller, product's height adjustment screw, safety acrylic cover (OPTIONAL), electrical panel, motor & AC drive. Rigid, vibration free construction for trouble free operation and the performance. A pair of bottles holding belts holds and centres the Bottles in a perfect position both for the cup pickup and pressing operation. Change parts not required for changeover of Bottles. Belt can move to accommodate Bottles from 40mm to 65mm. Height adjustment for Cup Pick up for different heights of Bottles or precise pick up is absolutely made simple through a jack. Cup feeding is controlled through a Varia. 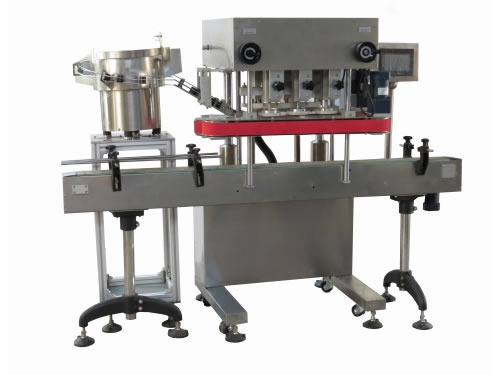 Totally synchronized pressing Rollers for perfect tight fit cup pressing and easily adjustable devices for different height of bottles. 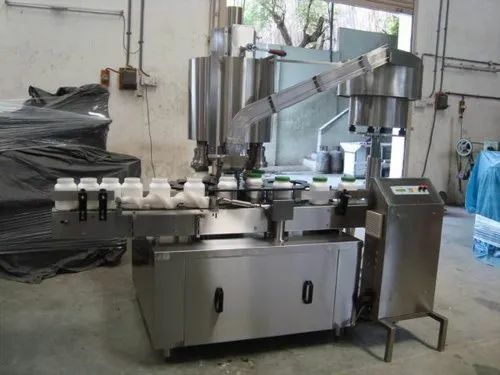 The change parts will be required only for changeover of different shapes of cup & sizes, whereas for bottles diameter & height only simple adjustments are required, which makes this unit versatile. Main MotorCap 1.5 HP / 415 Volts / 50 Hz. 2HP / 415 Volts / 50 Hz. Feeding Bowl 0.25 HP / 415 Volts / 50 Hz. Height of Conveyor** 860 mm to 910 mm. * Depends on vial size, cap size and type of cap. ** We can supply as per customer requirements. 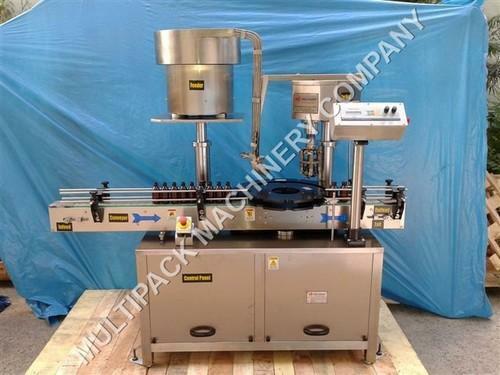 *** With help of change parts.‘BHAGWATI’s Automatic Aluminum Cap Sealing Machine is versatile, self-supported on stainless steel leg with height adjustable adjustment system. The machine is precision built on sturdy welded steel frame completely enclose in stainless steel sheet and doors are providing to facilitate the servicing of machine. The feed container moving on conveyor belt are feed into an in-feed star wheel through In-feed worm, star wheel bringing the container below the sealing head in the subsequent indexing part, mean while the vial pickup a cap from the delivery chute of cap filling bowl, where the body and the neck of the container are positioned below the rotating head, where the sealing head is performing perfect operation of sealing. 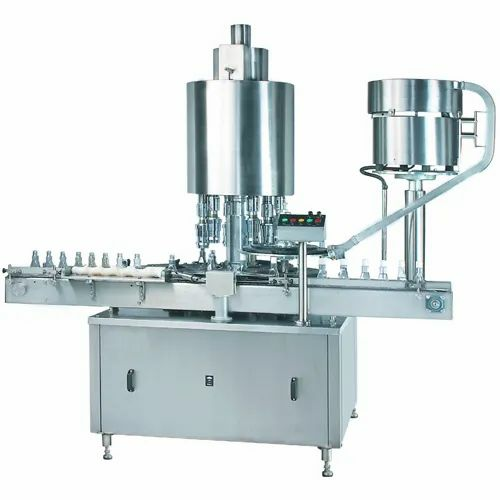 Capping machine, also know as cap-tightener or capper, is specially designed to treat plastic screw-on caps onto all types of bottles. Bottle cappers are designed to be compact, stable and flexible in operating, and easy to maintain. 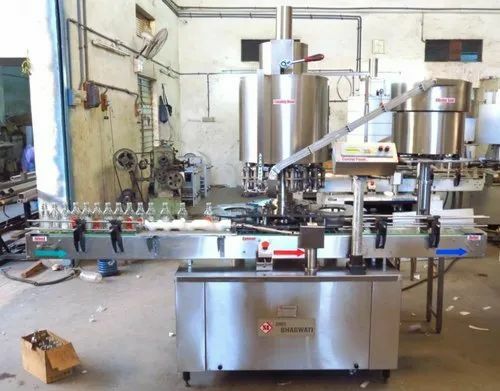 We develop our own state-of-the-art bottling solutions for various industries, including Food and Beverages, Toiletries, Household Chemical, Agrochemical, Petroleum-based Lubricants and many more. 2 HP / 415 Volts / 50 Hz. *Depends on bottle size, cap size and type of cap. ** We can supply as per customer requirements. *** With help of change parts. 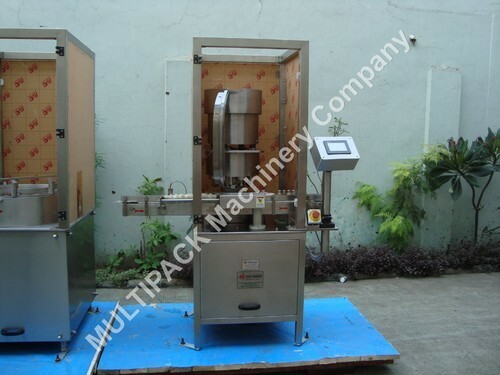 The Bhagwati automatic cap sealing machine is precision built on sturdy welded steel frame completely enclose in stainless steel sheet and doors are provided to facilitate the servicing of machine. (A) Container: Star Wheel, Back guide, Feed Worm. * Depends on size, shape and Neck Dia of container. ** Can be supplied as per customer requirements. *** With help of change parts. SS elegantly matt finished body Single motor synchronizes conveyor, star wheel, & platform turret. Self lubricating UHMW- PE guide profile for low friction wear surface, smooth and noiseless conveying. A/C drives to synchronize, Conveyor, Star wheel and Platform turret & capping bowl. No cup no container arrangement. 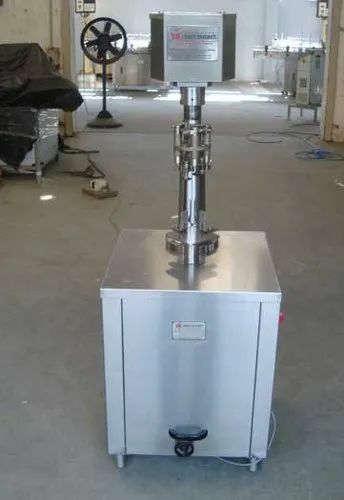 Parts coming in contact with the vial / aluminium cap / exposed to the atmosphere are made out of stainless steel, good house keeping and good manufacturing practice. Single motor synchronises conveyor, star wheels and platform turret and speed can be varied by the % speed pot on operating panel. A Special clutch device is incorporated on the in feed worm and Star wheel system for stoppage of machine in the event, vial is over turned or over diameter. A photo sensing device stops machine automatically in the event, there is no aluminium cap in delivery chute. “No Stopper on Vial, Machine Stops System”, eliminates chances of sealing of vial without rubber stopper on sealing machine. A.C. Frequency drives for Main drive. Acrylic Cabinet with Aluminium Structure for Machine. 1.5 HP / 415 Volts / 50 Hz. 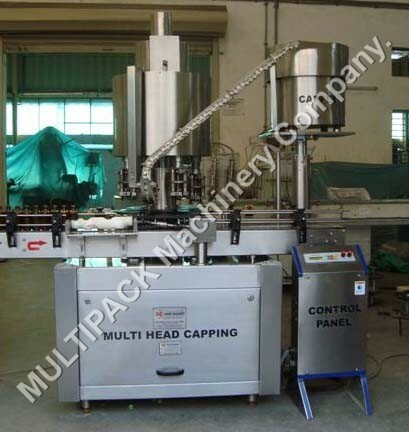 The process of Induction Cap Sealing is based on the principle that a conductive material i.e. Al Foil heats up on exposure to high frequency magnetic field generated by an Induction Unit. This is a non contact process without direct heat transfer. Due to this, the sealable closure liner can be placed in the cap by the manufacturer. The Wad consists of a board packing material, a wax layer, Aluminum foil and a sealable film. The screw cap combination passes through the induction unit after closure of the container. When the container is under the induction head, heat is developed into the Aluminum layer. The wax layer starts to melt and penetrates into the board layer. The Sealing layer also melts & forms a tight seal against the lip of container. The necessary pressure is provided by the liner/screw cap combination. On opening the container, the board remains inside the cap and serves as a seal on further use, whereas the aluminium foil is permanently sealed on the rim of the mouth of container. 1 HP / 440 Volts / 3 Phase / 50 Hz (Four wires) For Main Machine. * Depends on bottle size, cap size and type of cap. ** We can supply as per customer requirements. *Depends on bottle size, cap size and type of cap. Capacity Up to 1000 to 3000 bottles/Hr. Minimum : 6 Bar, 0.5 CFM. 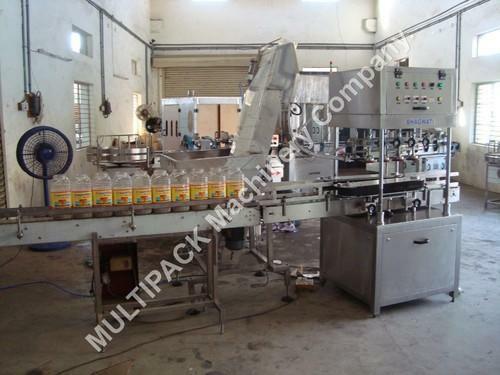 Production Capacity: Up to 1000 to 3000 bottles/Hr. Voltage 1 HP / 440 Volts / 3 Phase / 50 Hz (Four wires) For Main Machine. 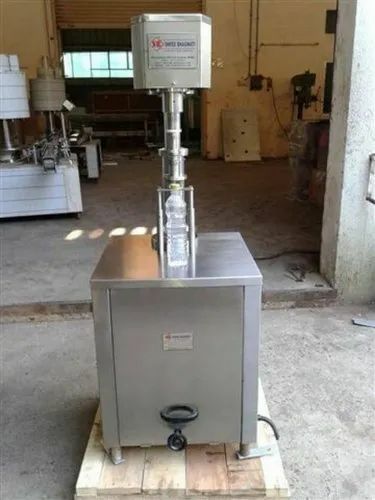 Looking for “Capper Machine For Bottle”?